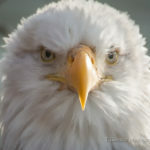 Toward the top of my list of “favorite things to do,” photographing bald eagles rates pretty high. 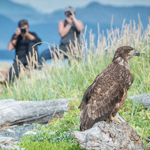 Throughout the year opportunities abound, ranging from their day to day activities, to nesting and fledging, culminating in the gathering of thousands of bald eagles for a late salmon run at the outset of winter. When I need a few more “likes” or friend engagements on social media, I find posting a photo of a bald eagle seems to do the trick and tickle everyone’s fancy. In this blog, I would like to share some information about my “prey” and share a few insights into what it takes to get what I got. 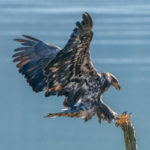 Among members of their class, photographing bald eagles (Haliaeetus leucocephalus) provides both challenges and rewards. The sizable eagle is relatively easy to photograph in comparison to smaller and more flighty birds. The bald eagle often sits stoically upon a branch or rock keeping time with a purpose beyond our reckoning. The biggest challenge comes with respect to exposure. The head of a mature bald eagle, in addition to being spectacular, is rather specular, which is to say reflective. A small amount of light can quickly lead to an overexposed head, resulting in what I refer to as a 100-watt eagle. Focus can also be a challenge when and if the eagle decides to take flight. 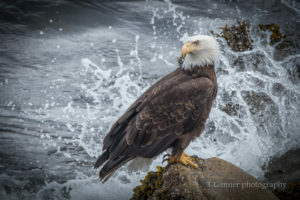 For technical aspects of photographing the bald eagle, I would refer the interested reader to my section on Wildlife Photography located in the Tour Notes section of my website. The reward of photographing the eagle is apparent. Our national symbol is of course, iconic and often dramatic. It cannot help but stir emotions within us. Ansel Adams informed us many years ago, that “a good photograph is knowing where to stand.” Perhaps playing his cards close and keeping his winning edge to himself, or perhaps not to dissuade his fans, he did not mention how long it might take to stand in any given spot. The wildlife photographer learns quickly the value of patience. Or at least the necessity of patience. At times, I have come across a precious and timeless moment through nothing more than good fortune. On the whole, however, “being there” is not a moment in time to be realized without the scaffolding and investment of days or weeks of “hurry up and wait” mentality. This is not without its own rewards. I am completely satisfied to spend countless hours standing in the middle of nature or wilderness, in comparison to waiting in queue at the doctor’s office. It is often a contemplative process that lends itself to a certain inner peace. Many landscape photographs are the result of wildlife photographers waiting for the wildlife to appear. During this time of year, I spend a lot of time engaged in watchful waiting along the Chilkoot River corridor north of Haines, Alaska. This is a relatively convenient area to engage with. There is a salmon stream that runs a half-mile between the lake that feeds the river, and its exit into the estuary of Lutak Inlet at the north end of the Lynn Canal fjord system. A road parallels the length of the river, which makes staging a relatively painless effort. Several bald eagle nests are located along the edge of a spruce forest on the far side of the river. One particular nest has been quite reliably active, and I am in the fifth year of observing this nest. Bald eagles are known to mate for life (an average of twenty-five years in the wild) and will often return to the same nest year after year. They will build upon existing nests regularly, and the largest nest ever measured weighed more than two tons, and finally fell out of its tree in Florida due to its weight and the weather. 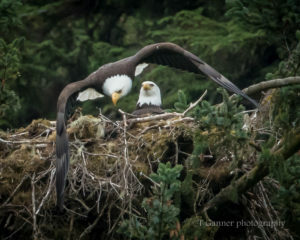 Our eagles here in Alaska engage in courtship and nest building around February, and lay their eggs in late April. 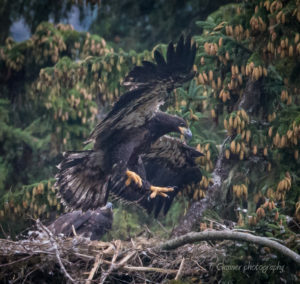 Mama eagle will often lay three eggs, each a day apart. Incubation lasts about 35 days, and the eggs hatch in the order they were laid, similarly a day or so apart. Sibling rivalry often turns to fratricide, wherein the younger and weaker hatchlings are killed or starved. (It is difficult for the parent to send Junior to his room for a time-out, given the circumstance. No wonder they always look so stern about things.) The hatchlings will grow to nestlings and then fledglings in about 75 days. In that time, they grow from 3 ounces to 12 pounds. If the same rate of growth were to be applied to a human baby, an infant born to an average 7.5 pounds would weigh in at about 500 pounds in ten weeks’ time! Presently, as I write this blog in the early half of June, this is the time I start keeping a close eye on the nest. 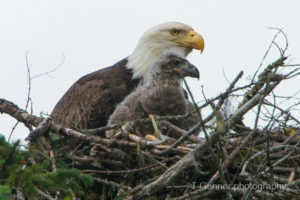 For as many photos as I have made of eagles, getting a shot of mom or dad flying into or out of the nest never gets old. The grand prize is catching the first glimpse of the hatchling poking his head above the edge of the nest. A bonus is seeing two heads. I believe in the last two years, I have had the honor of being the first witness of their public appearance. I am quite happy to “set up shop” next to my car with both camera and spotting scope. Firstly, it takes a really big lens to accomplish the reach necessary to capture a meaningful image. 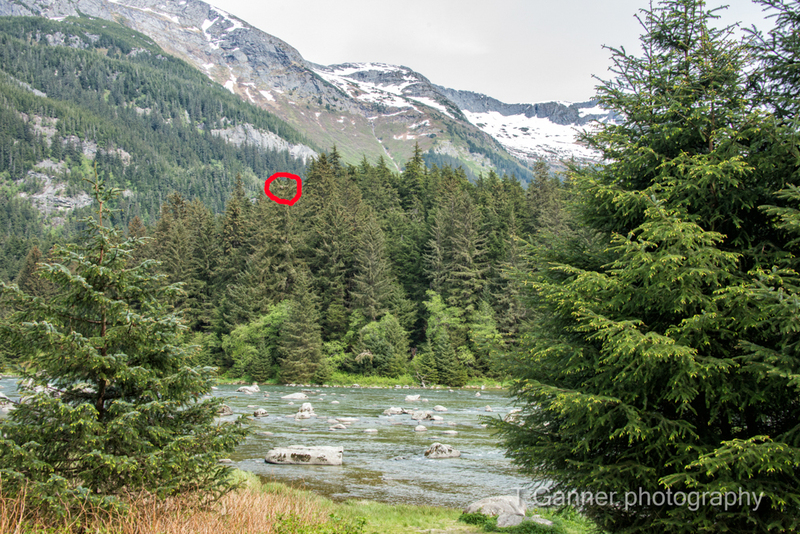 The nest is quite far away, being across the river and sitting atop a tall spruce. I use a 500 mm f/4 prime lens with a 1.4 teleconverter (changing 500 mm focal length to 700 mm) with a high-resolution camera (Nikon D800 with 36 megapixel resolution) on a tripod that costs more than most people are willing to spend on a camera. What helps me to pass the time is the enjoyment of talking to people who stop by wondering what I am photographing. 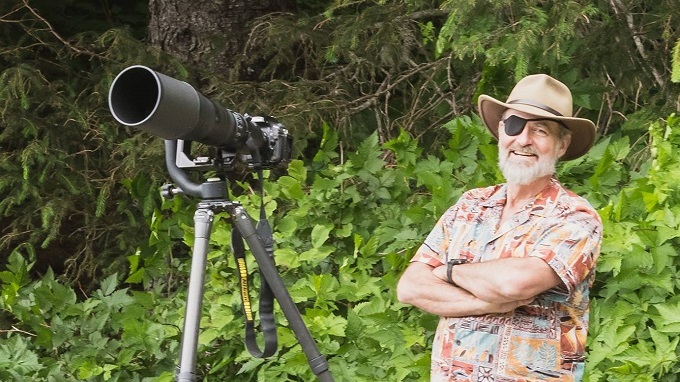 I attract attention with the equipment, and I always have a spotting scope set up as well so that folks can get a good gander (pardon the expression please) at the nest I am watching. The funniest comment ever was a person who paused in their car to ask if I was photographing a bear, while my camera was obviously pointed at the top of distant trees. To be successful in capturing those special moments in time, does require time. We are talking days at a time and hours per day. Compared to some stories I have heard of completely dedicated bird photographers who spend weeks in a wet blind waiting the perfect moment of some obscure and unique behavior of the part of their prey, I count myself as fortunate to have a relatively easy life that entails going home at night for a nice supper. The time I do spend in watchful waiting is a joyfully contemplative process involving observing critters, breathing fresh air, and listening to the sounds generated within the domain of one of America’s remaining pristine salmon rivers. Along the way I feel privileged and honored to have the opportunity to get to know the locals, including bald eagles, blue heron, kingfishers, Stellar’s Jays, myriads of ducks and gulls, American dippers, brown bears, mink, salmon, char, state park volunteers and other two-legged creatures. A portrait of the artist as an old man, considering changing my dba to “Deadeye Photography.” A tale for another day. The young eagle has become a fledgling and is making his first flights from nest to branch. As the season progresses, the plot evolves. As mentioned, the young eagle grows visibly from day to day, developing from a soft ball of fluff and down to a full-size fledgling ready to take his first flight from the nest. It is exciting to witness the first attempts at flight, usually involving some awkward flapping and hopping from one branch to the next, or just stretching those new wings and beating at the air in anticipation of new found freedoms. 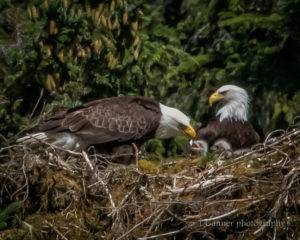 Statistically, approximately half of young eagles do not make a successful first flight from the nest, and find themselves grounded below the nest if they survive the fall. Typically, the adult will continue to feed the fledgling and the young one may in time successfully fly. Overall, the mortality rate for eagles is greater than 50% in the first year. The patient observation is a labor of love and an investment in some emotional attachment that develops as one watches an innocent come into the world and find his way. The journey through time in this space of the Valley of the Eagles will continue through the season with the run of the pink salmon, and the appearance of our brown bears, and ultimately in the late fall and early winter when the chum salmon run up the Chilkat River and thousands of eagles gather and fight over a late feed. Those are tales to come. Those who wish to join me should consider any of the workshops I am offering for destination travelers, linked below. Please, stay tuned. Raven shares wisdom with Bear and why I am writing blogs again. Tom, I remember last year setting up my equipment “waiting” with you and looking, I believe, at that very nest. That was when I first met you and am so glad that I did. Keep up the good work and blogging! Very nice narration, izzat an Alaskan print shirt? I am such a big fan of your blogs, writings, tales, tips and photographs, Tom!! Seems I can’t get enough and find myself devouring your websites, looking for something I may have missed. Thanks for sharing your talents with us!